When an alien ship is found in Antarctica palaeontologist Kate Lloyd (Mary Elizabeth Winstead) is called to oversee the dig site. Assisted by staff from a near by Norwegian station and American helicopter pilot Carter (Joel Edgerton), Lloyd helps to extract a frozen life form which soon wreaks havok on the secluded science station. Acting as a prequel to John Carpenter's 1982 film of the same name, The Thing manages to bring the old school thrills without resorting to cheap guts and gore like many recent horror movies. Instead it uses the seclusion of the Antarctic station to its fullest, emphasising the helplessness felt by this handful of scientific researchers when faced with a horrific anthropomorphic abomination which can inhabit the body and likeness of any one of them. 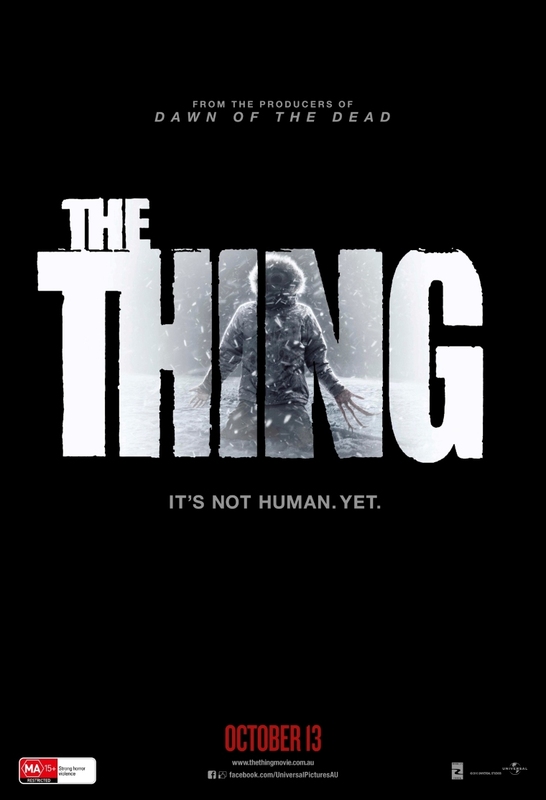 The Thing, although sharing the same name as the 1982 film, isn't a remake. It is a direct prequel to the original film and leads almost directly into the beginning of the original classic, answering the well known tagline "My god, what the hell happened here?". One thing that sets the two films apart is the overt nature in which the the monster appears throughout. While John Carpenter used the unknown as a fear agent, first time director Matthijs van Heijningen decided to put the CG creature in the fore with horrific consequences. It is truly something hideous and unlike anything that I would ever care to see. I can't stress just how gruesome it is. The creature attacks and absorbs its prey, taking on its likeness and morphing into a horrible abomination that just doesn't sit right. The graphic, in-your-face nature of the beast is subtly offset by an ingrained creepiness that stems from the science stations isolation. These scientists are trapped. A number of strong performances really made the movie as good as it is. First off, Mary Elizabeth Winstead shrugs off her role as Rowena from Scott Pilgrim and manages to play a softer version of a Ripley-esque type of character, tough but not unbelievable. Joel Edgerton does Australia proud and shows that he definitely has what it takes to be our next leading man. He also manages to deliver the best American accent that I've heard from an Aussie in a long time. The most impressive performances, however, were given by Norwegian actors such as Stig Henrik Hoff, Carsten Bjorland and especially the ginger-bearded Kristofer Hivju. What struck me straight away was the beautiful cinematography which was provided by Michel Abramowicz of Taken and L'empire des Loups fame. He managed to lull me into a false sense of security by highlighting the incredible beauty and expansiveness of the Antarctic before trapping our hapless scientists in a demountable building of no bigger than 5 or 6 rooms. This juxtaposition made escape feel like a real possibility before highlighting the fact that death was assured regardless of the circumstance. Stay or leave, you're going to die. A truly enjoyable yet scary thriller with horror sensibilities that buck recent trends and allow for thrills and chills without resorting to gore. The Thing hits Australian cinemas today.